Perhaps you have written a Flow and have seen this cryptic message. NO!!! What happened!? Does your User know something went wrong? Where did this come from? This post, part 1.D of the Learning Flow series, will help you learn how to get better error message handling for both your Users and your Admins. This blog post was originally called, “Add in a Price Book selection in the input Screen”. That title doesn’t do justice for Dynamic Choices, so the title has been updated to, “Find Related Records and Have Users Select Them in a Screen”. The goal with this post is to understand how Flows can be related to different records and be able to select records through a pick list of dynamic choices. This means that you are able to connect and update records beyond the record the User is working on as well as let Users pick which records they want to associate or update. That is powerful stuff! 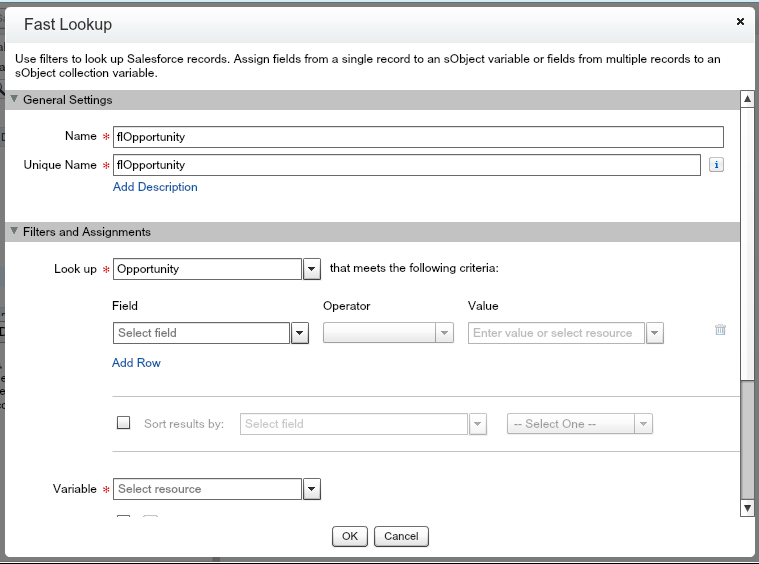 You’ll learn more about the full power of Flows and updating related records as you continue to learn through the Learning Flow series, but this post will be focused on finding those related records and allowing Users to select them. Time to get started! Open up the Flow that you created in Create an Input Screen for Users, Assign Variables, and Create a Quote – Learning Flow 1.A. The business liked your original Flow but would like for users to be able to add a Contact from the Account into the Quote so the business knows who the Quote is for as well as have Users select a Price Book based on security restrictions. To start, you’ll need to find the Account Id. With your Flow open, drag a Fast Lookup element onto the Canvas to the right above the Quote Entry Screen. Name this Fast Lookup element flOpportunity, which stands for Fast Lookup Opportunity, for both the Name and Unique Name. In the Filters and Assignments section below, Look up Opportunity. When you do, that, you’ll see more fields pop up for you to fill out.